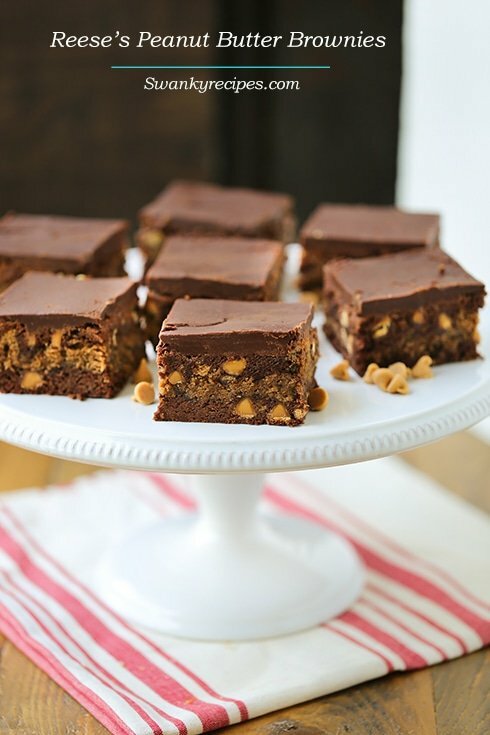 A fudgy, rich brownie made with Reese’s peanut butter chips and chocolate spread. 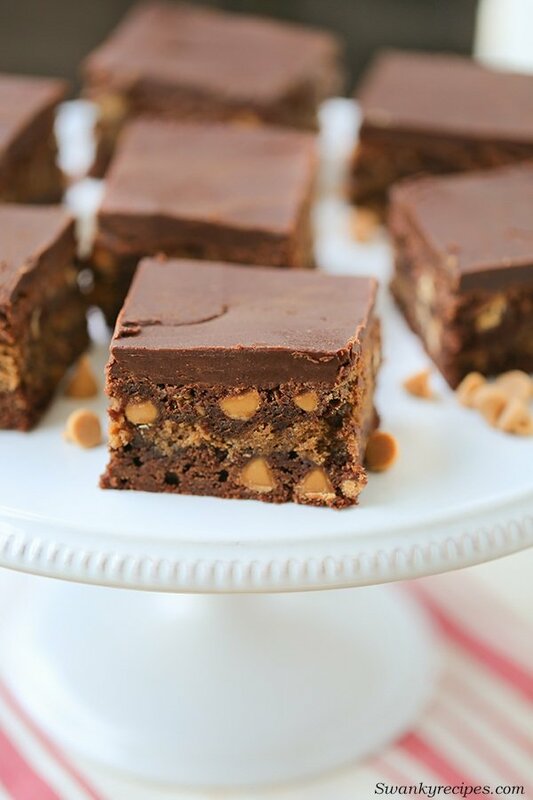 These decadent brownies are one of the best chocolate and peanut butter desserts that are truly Reese’s Peanut Butter Cup inspired. These Reese’s inspired brownies boasts a superior taste, one that will be enjoyed over and over again. I can remember the first time my mom made these brownies. It was just after school let out and I’ve been hooked since. 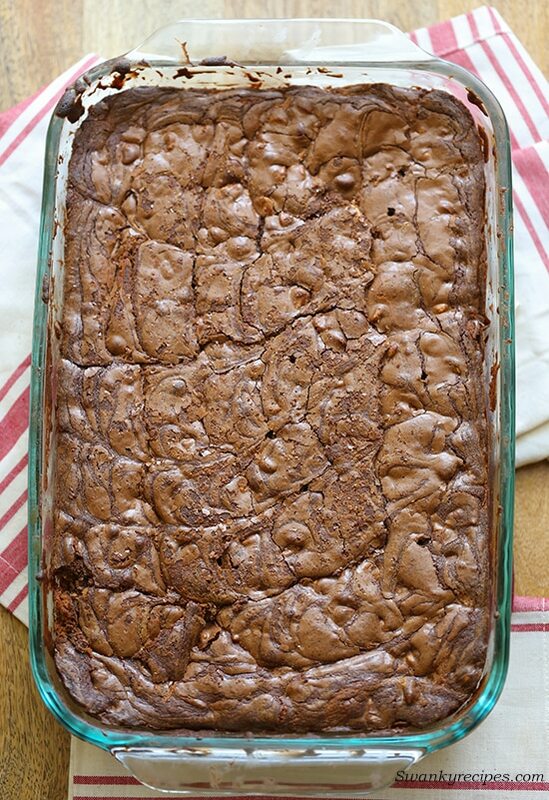 These brownies are truly one of my absolute favorite brownies that mom passed onto me. I have fond memories cooking with my mom in the kitchen. Now that I’m older, I can say that making desserts in the kitchen with mom cemented the foundation of my love for baking. 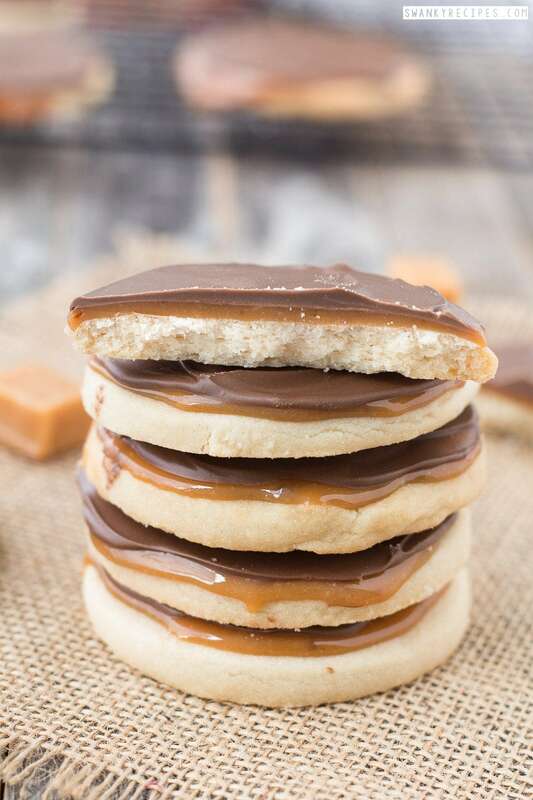 If you’re a Reese’s Peanut Butter lover, this recipe is for you. It’s like a little slice of heaven baked into chewy yet crumbly brownie. 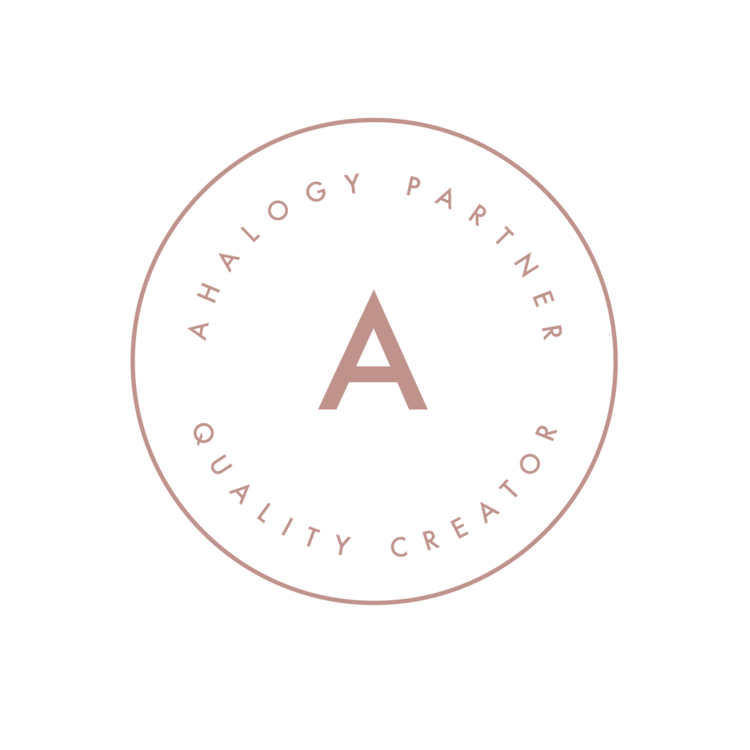 It’s one of my favorite flavors to experiential with and when you try these bars, you’ll understand why. If you love fudgy brownies and a thick, super decadent frosting this recipe is for you. This recipe has 4; one-two-three-four layers of chocolate! It really makes eating the batter hard not to do but the finished goods are one of the best brownies around! To make this recipe, start by making the brownie batter then spread half of it into a prepared baking dish. Next, top it with peanut butter filling then spread the remaining brownie batter of the top. Use a knife to marble the brownies by pulling it through all the layers then bake it for 40-50 minutes. Guys, the frosting is one of my keepsake recipes for ultra thick and fudgy icing. It starts with a good quality, unsweetened chocolate bar melted on the stove top with a little butter. Melt a few tablespoons of Reese’s Peanut Butter spread into the saucepan and remove it from the heat. Stir in the remaining ingredients and evenly frost the brownies. The Reese’s spread can be next to the peanut butter aisle in the grocery store. Do not skip out of this spread! It’s seriously like eating a peanut butter cup. As a side note; it’s wonderful to eat with a spoon or spread on toast. I’m not sure how I made it through life without it before. A fudgy, rich brownie made with Reese's peanut butter chips and chocolate spread. These decadent brownies are one of the best chocolate and peanut butter desserts that are truly Reese's Peanut Butter Cup inspired. Preheat oven to 350 degrees F. Grease a 13x9-inch pan; set aside. In a medium bowl, whisk flour, cocoa powder, baking powder and salt then; set aside. 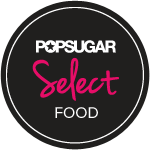 In a large bowl fit with a mixer, combine 2 cups sugar and 1 cup softened butter: beat until light and fluffy. Add 4 eggs, 1 at a time, beating well after each addition. Stir in vanilla extract. Gradually add flour mixture to sugar/butter mixture; blend well. Stir in peanut butter chips; set aside. 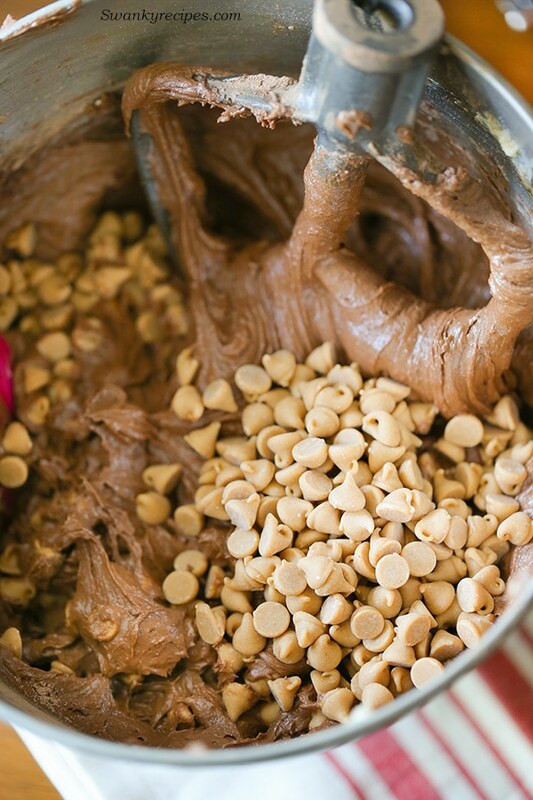 To make the peanut butter filling - In a small bowl, combine both peanut butters and 1/3 cup butter; beat until smooth. Add 1/3 cup sugar and 2 tablespoons flour; blend well. Add 3/4 cup teaspoon vanilla extract and 2 eggs; beat until smooth. To assemble, spread half brownie batter in greased pan. 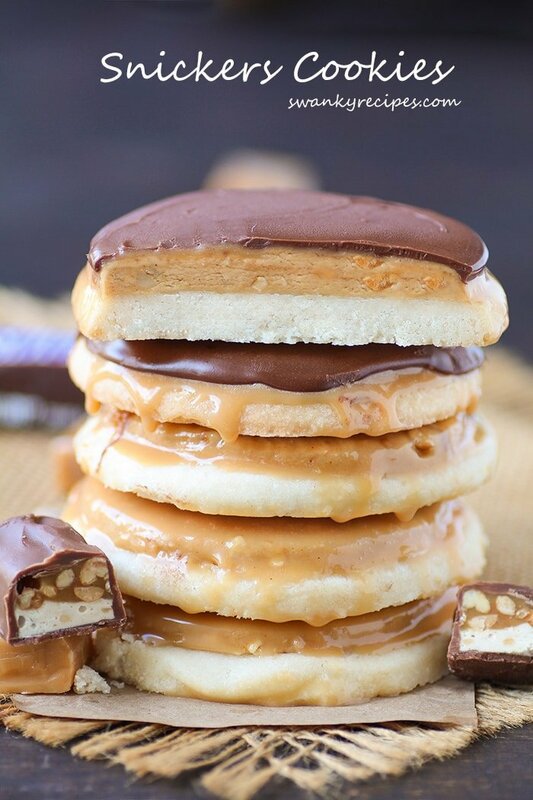 Scoop peanut butter filling on top and smooth with spatula. Spread remaining brownie batter on top. Using a knife to marble the batter, pull knife through layers in wide curves. Bake at 350 degrees F for 40-50 minutes or until top springs back when touched or toothpick inserted into the center comes out clean. Cool completely. To make the frosting - In a medium saucepan over low heat, melt chopped chocolate and 3 tablespoons butter, stirring until smooth. Remove from heat and stir in Reese's peanut butter spread until melted. Stir in powdered sugar, salt, vanilla extract and enough water for desired spreading consistency. Frost brownies and cut into bars. Chocolate and peanut butter are my absolute favorites! 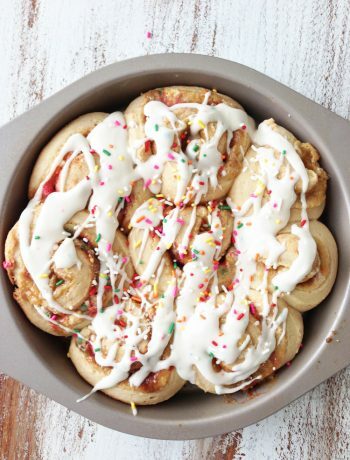 This sounds delicious – thanks for sharing this recipe! These look and sound great. Great pics too! I’ve tried quite a few versions of brownies, from very chocolaty to pretty simple, and they all were delicious. 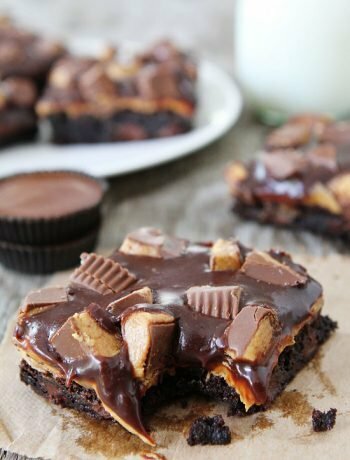 But these peanut butter brownies are brownies taken to a whole new level. I love the crunch you get, a very scrumptious recipe. 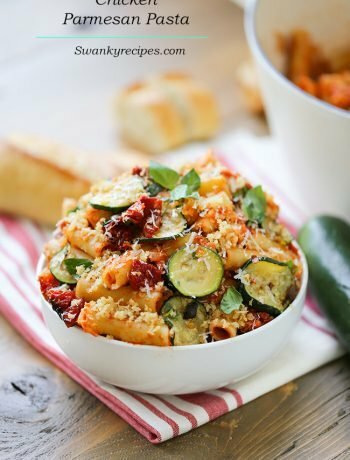 This recipe makes me swoon! The finished brownie looks fabulous of course but the picture of the chips in the mixing bowl is just awesome!